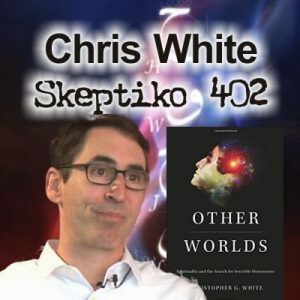 I really enjoyed having Dr Chris White on Skeptiko today and we talked about other topics like how much of this dark, dark dystopic, apocalyptic science stuff is socially engineered, is designed to make us feel even more isolated, afraid, alone. It certainly keeps us away from any kind of deeper examination of spirituality. In addition to mainstream materialist science there is also the scientific work of psychical research(7), parapsychology(8) and NDE research(10) which have provided evidence for ESP, non-physical consciousness, and the afterlife. We have had a series of séances with Eusapia Palladino at the [Society for Psychical Research] It was very interesting, and really the phenomena that we saw appeared inexplicable as trickery—tables raised from all four legs, movement of objects from a distance, hands that pinch or caress you, luminous apparitions. All in a [setting] prepared by us with a small number of spectators all known to us and without a possible accomplice. The only trick possible is that which could result from an extraordinary facility of the medium as a magician. But how do you explain the phenomena when one is holding her hands and feet and when the light is sufficient so that one can see everything that happens?" 1. There is in us a faculty of cognition that differs radically from the usual sensorial faculties (Cryptesthesia). 2. There are, even in full light, movements of objects without contact (Telekinesis). 3. Hands, bodies, and objects seem to take shape in their entirety from a cloud and take all the semblance of life (Ectoplasms). 4. There occur premonitions that can be explained neither by chance nor perspicacity, and are sometimes verified in minute detail. Such are my firm and explicit conclusions. Naturalism is an extraordinary claim. NDE research may not be considered mainstream but the prominent researchers in the field are all medical doctors or scientists who were considered mainstream until they began to study NDE's. Several have said the held conventional materialistic views regarding consciousness until they began to study NDEs. Great interview! Dr. White is an open minded, yet down to earth, reasonable and knowledgeable guy. I hope Chris is going to join the discussion. I'll have more to say after I have thought a little more. I should add that winning the favor of the Creator is accomplished by doing right through life. If a yet able bodied retired person spends his summer growing vegetables to mostly give to the less fortunate; or his winters blowing and/or shovelling snow for elderly, less able neighbors without charge; or providing the Creator's birds with a bit of seed during hard cold winter days. The Creator knows of all such actions and such a person becomes due good fortune as opposed to misfortune. Among other things he will remain able bodied for instance. I'm wary of anyone casting absolutes about when it comes to Christianity. I think its ignorant at best and arrogant at worst. You can find examples of behavior in any metaphysical worldview that are unbecoming. This type of typecasting effectively tells us nothing that truly discriminates between them. I agree with much of what you say. But I’m not so sure that either the Atheistic socieities or that atheistic individuals as a whole or in general (on average) have behaved any better in sum. Christianity has produced a lot of charitable behavior from many a “good Christians” and Christian organizations etc. And I do think that a lot of these charitable actions might be owed to their beleifs. There are lots of Churches who have formed great, caring, compassionate, and socially active congregations. Even though I’m not a Christian anymore, I consider my old church a great group of people. And I do think it’s (st least largely) owed to their beliefs and the community formed around their beliefs. Yes, fully recognized and agreed Wormwood. To a degree however it is that simple. Do not confuse good works with spiritual authority - as this is a deception. For me, it is not the symbolic acts men do - but the intent and rationale behind their doing. Mafia members walk the streets handing out cash, they open orphanages, they build buildings. This is not a sign of their spiritual authority. Anyone can inhabit the costume of goodness. Especially evil. Not just anyone can change the nature of their soul. It is that of which I jokingly accuse my alma mater. Graduates of my alma mater are highly touted in industry as being the best - as acknowledged by their sheepskin. But I object and say that it is the graduates themselves which have produced this mantle, not anything in particular done by the alma mater per se. There is nothing good about worshiping hell, and placing people under that psychosis. In fact it is rather evil as a practice. It is almost exclusively profit focused. But there are good people all about. You don't get to derive spiritual credit through just having them in your midst. No of course I never would. But I was speaking more or less directly to the “I’d rather have atheism any day” statement. I guess the answer, or the challenge to that statement really comes down to what you’re looking to get from (or avoid getting) from either philosophy. If you’re speaking in terms of spiritual philosophy, then whichever one suits you best is a very individual thing. I know I’d rather be “spiritually” a Christian than a materialist, but certainly others would feel differently. However, I was sort of speaking in terms of the society produced by either belief and the actions of people towards others as influenced by their beliefs. In this sense (and maybe this wasn’t even the sense that the original writer of the post was referring to), I was questioning whether or not the atheistic belief is more desirable one than Christianity. Maybe I’m a little biased at this moment as I am currently reading “The Rise and Fall of the Third Reich”, which produced a philosophy of wide scale extermination based upon a philosophy of genetic, materialistic supremacy. Then we also have the examples of “Christian nations” and leaders and people’s who have also behaved horribly. So it’s a confusing thing to attempt to ponder correctly. There was an old man who had lived with his wife and grown wealthy over decades of operating his business. His wife had passed on without issue. So in his declining health and loneliness he contracted for two men to move in with him and attend to the affairs of his large estate. The lead of the two men was a health practitioner and addressed the old man's daily aches and chronic illness, bringing him medicine, food and good cheer when the old man was down, and revived him when near death. The second man made the old man's meals and managed the estate's household and finances on his behalf. As the old man continued to grow more sickly towards death, it happened that the estate bank called in an auditor for tax purposes to audit the man's household in preparation for his passing. Once in the household, the auditor noted that the account balances repeatedly had shown up as slightly short each period. As well, he noted that the supply of rat poison in inventory had dropped slightly each period, despite there being no groundskeeper working for the estate. The auditor had the old man's blood tested, and it showed positive for chronic exposure to prothrombin. So the auditor notified the bank, who had the sheriff come and arrest the two men both. Upon their arrest, the lead man exclaimed 'T'was him not me! Was I not the one who cheered the old man in his illness? Was it not I who kept him alive? Was it not I who brought him analgesic, food, water and soft words of mercy in his time of strife? The money and the poison were only very slight in their burden (quotidie mortem).' To which the auditor replied, 'You were the worst of the two. For not only did you fool the old man, but you fooled yourself as well - into believing your own milieu of goodness. At least the second man knew he was a thief and a murderer. Yes, this is the critical path point - such a thing does not actually exist. The Creator knows what is in our hearts. Our good works are best carried out while the person for whom we are performing them and his or her challenges are before our vision and our consideration. This is commonly called unconditional love. To more fully comprehend this may I suggest the Gospels of Jesus and in particular the parable of the Good Samaritan. The three men stared at each other, until finally one broke the silence and said 'Well, he never really ate the candy.' And they continued to munch merrily along, examining all the beautiful candy shells colors in their bowl.